Mendoza, Christian. “Tony Orrico.” La Tempestad. June 2015. Garden, JF. “Tony Orrico: Movement Toward Definition.” Art in DF. June 2015. Burnett, Victoria. “At This Mexican Retreat, Artists Work with the Community.” New York Times. May 2015. Young, Stephanie. “Tony Orrico’s Drawings Test the Limits of Physical Movement.” Beautiful/Decay. January 2015. Samuel, Nina. “The Brain in the Fingertips.” My Brain is in My Inkstand: Drawing as Thinking and Process [Catalog]. Cranbrook Art Museum. 2014. Kerr, Merrily. “Tony Orrico at PPOW Gallery.” New York Art Tours. June 2014. Orrico, Tony “Voyage of the Transfer.” PAJ, MIT Press Journals. Volume XXXVI, No. 2. May 2014. Kosciuczuk, Krzysztof. “For Each Gesture Another Character.” Frieze, Issue 163. May 2014. Messinger, Danny. “Quantifying the Qualitative: Tony Orrico’s Artistic Works Push the Envelope of Art and Science.” Michigan Tech News. March 2014. Kadlec, Alexandra. “Cranbrook Art Museum: Drawing as Thinking and Process.” The Seen. February 2014. “Getting Down and Dirty, Orrico Draws.” District: The Student Voice of SCAD. February 2014. Carrier, Johanna and Marine Pages. “ROVEN, Revue Critique.” Roven Editions, Paris. No. 10. 2013. Mariscal, Sofía. “Tony Orrico, Penwald: 8: 12 by 12 on knees.” MUNAL 1912-2012 [Catalog]. September 2012. Firmin, Sandra Q. “Artist Becomes Human Spirograph.” UB Reporter. September 2012. Williams, Austin R. “Tony Orrico: Drawing at the Speed of Daylight.” American Artist Drawing. Summer 2012. Tone, Jack. “Intérieur / Extérieur: Tony Orrico and Dan Miller.” Entre. No. 4, May/June 2012. “Tony Orrico Performance at Polyforum Cultural Siquiros, Mexico City [Video].” Huffington Post. April 2012. Talasek, JD. “Convergence: The Art Collection of the National Academy of Sciences.” Cultural Programs of NAS. 2012. Sileo, Diego and Eugenio Viola. “Marina Abramovic: Italian Works.” Padiglione d’Arte Contemporanea, Italy. Volume 1. 2012. “88. Der virtruvianische Mensch.” Feld100. November 2012. La Rocco, Claudia. “Navigating Through Time and Space.” New York Times. November 2011. Kourlas, Gia. “Body and Brain Both Stretched To Their Limits.” New York Times. November 2011. Kampe, Adam. “Tony Orrico: Spontaneously Navigating Space.” N.E.A. Arts Magazine [podcast], No 4. November 2011. “Tony Orrico: Choreography’s Shape on Paper.” Poptech. October 2011. Zellen, Jody. “Tony Orrico: Shoshana Wayne Gallery.” Artillery, Volume 6, Issue 1. September/October 2011. Ullman, Leah. “Tony Orrico: Shoshana Wayne.” Art in America. September 2011. 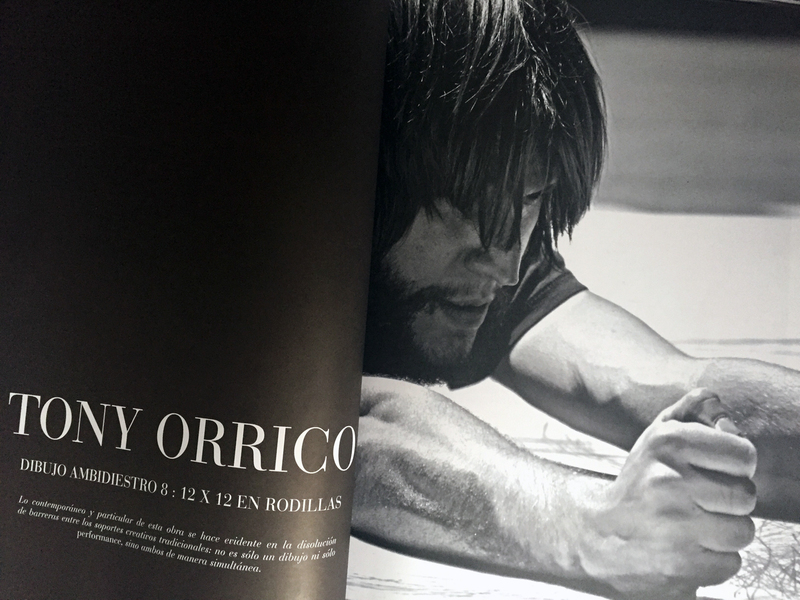 “Performance: Tony Orrico.” The Magazine of Yoga. May 2011. “Tony Orrico- The Human Spirogrpah.” Oddity Central. May 2011. Mazza, Lorenzo. “8 circles, ‘perfomance drawing’ de Tony Orrico.” Arts blog.it. May 2011. “Tony Orrico: The Human Spirograph.” National Performing Arts Convention. May 2011. Caurana, Pablo. “Entevista con Tony Orrico.” Teatron. March 2011. MacGregor, Katy. “Interview: Tony Orrico.” Metropolitan Barcelona. February 2011. Young, Stephanie. “Tony Orrico.” Vellum, No. 8. 2011. Morgan, Carmel. “Tony Orrico: Penwald: 2: 8 cirlces.” Ballet-Dance Magazine. October 2010. “flux/S Drafts Establishing Future [Catalog].” flux/S Foundation. 2010. Greskovic, Robert. “Drawn Into His Web.” The Wall Street Journal: Arts & Entertainment. September 2010.